This, however, has been a basic sauce in our house for quite a while now. I searched online for a vodka sauce as I was curious to try one and came across this one (**edit - see below!). It looked interesting as it used almonds to create the creaminess as opposed to the traditional cream. It is dead easy to make, very versatile and absolutely delicious. The original recipe blended in sliced almonds but I thought I would make it easier by just using ground almonds, or almond meal/flour. It works so well, when you add the almonds the sauce changes from bright red to a creamier looking orange and the sweetness of the almonds counters the sharpness of the tomato perfectly. I've been using ground almonds in loads of sauces now to get the same creamy effect, it's brilliant! I was also thinking this sauce would make a great pizza sauce, because basically, if I can find any new way of combining booze and pizza, I will :-) So I made my standard pizza base then made this sauce but simply cooked it down a little more so it wasn't as runny as a pasta sauce. Spread it over the base, topped with whatever I fancied at the time, bit of cheezly and baked. It was so good! As this is a very basic recipe it is quite versatile too. In regards to the herbs, I think I've used a different selection every time I've made this, from just oregano, to just thyme, to both, to basil to an 'Italian blend' mixed herbs etc... Just use whatever you have - the recipe is very forgiving. I've even made this with balsamic vinegar in place of the vodka when I discovered quite late that I didn't have any, was still delicious. Source: Recipe based on this one. Nutritional Analysis: just the sauce, whole recipe. *2012 Edit - I've since made a new variation on this sauce that we are having much more often than the vodka one. My son couldn't have the spice anyway and to be honest, I really couldn't see what difference the vodka was making in there. I did however love the idea of using almonds to make a tomato sauce creamy and came up with this basic tomato basil sauce using almonds for creaminess, body and their natural sweetness counters the acidity of tomatoes perfectly. 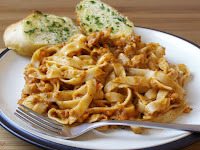 THIS is now our standard pasta sauce recipe :-) Recipe serves 3. 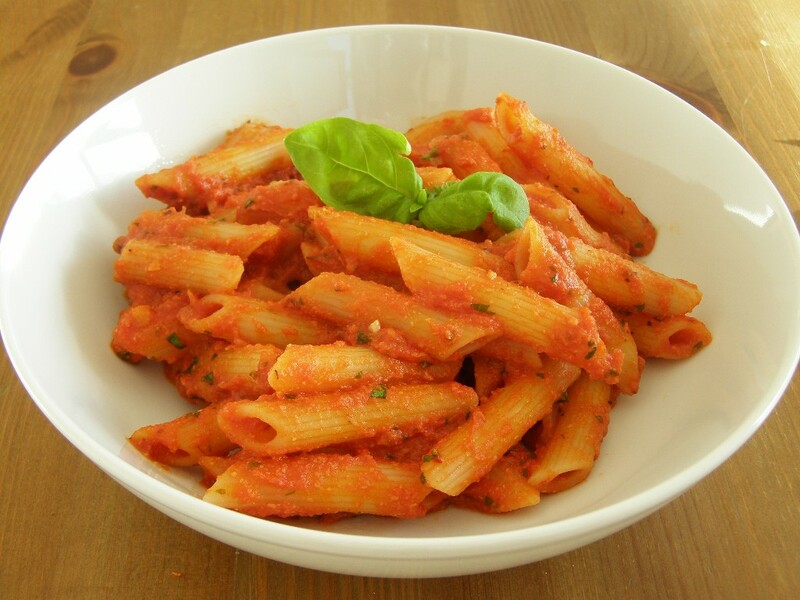 Blend the passata, ground almonds and water in a blender until smooth and creamy looking. In a saucepan heat the olive oil and add the onion, fry gently with a few grinds of black pepper until the onion is soft then stir in the garlic. Add the tomato sauce, salt and herbs and stir well, bring to a simmer, put the lid on and simmer for about 10 minutes until thickened and slightly reduced. Turn off the heat and stir in the fresh basil. Pour over freshly drained pasta and return to the heat for a couple of minutes, stirring well until everything is well coated and hot. Serve immediately. This looks delicious!!! Just last week I was thinking about trying to make a vegan tomato cream sauce and this looks perfect!! Also, congrats on your healthy livin'! Tried your great french toast earlier. Just made this "Creamy Spicy Tomato Vodka Sauce" with a few changes. Didn't add chilli flakes, used apple cider vinegar instead of vodka, didn't have thyme to add just oregano, and along with adding the basil at the end I added fresh cilantro and about 2-4oz of almond milk to produce more sauce. I also roasted eggplant, broccoli, red and green peppers, and red onion to mix into this dish. Thanks Debbie! It was my first time making my own tomato sauce, its simple and great. God bless. Hi Karla! Love the modifications you made :-) It's a very adaptable recipe all right!! I made this for the first time yesterday, making it again tonight. How is something so simple SO delicious? Amazing - thank you!